What’s the best way to organize your skincare routine? Should we layer from thickest to thinnest? Where does sunscreen go? I’ve been asked this a lot and I don’t have the answer. Most research on skincare application is done with just one product. Sunscreens are always tested on clean skin with no other products. If you want to get as close to the protection on the label, it’s best to recreate the conditions it was tested on, which means applying it on clean skin and not following it with anything else. The same applies for most cosmetic products as well. That’s not realistic for everyone and many of us enjoy using multiple products. But the reality with a lot of the advice found online and from experts is that it’s just advice and often isn’t based on evidence – especially scientific evidence. 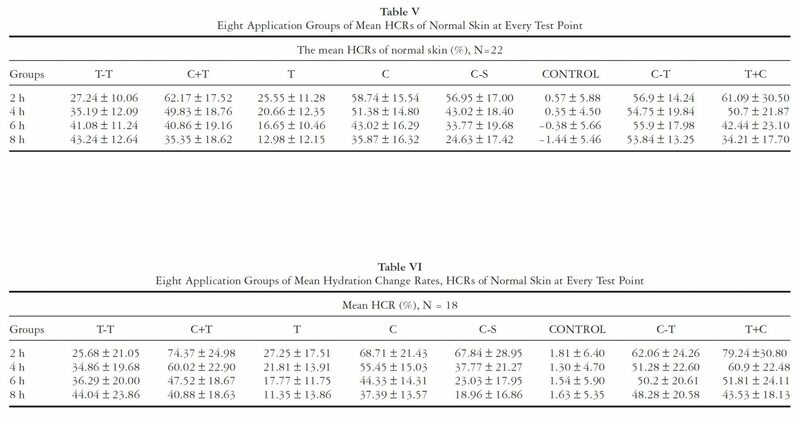 A group of Chinese researchers performed an experiment looking at the effect of different combinations of three products (moisturizer, toner, and mineral water sprays) and different application routines on skin moisture. Keep in mind that the only endpoint measured was stratum corneum moisture measured by the Corneometer, a capacitance measuring tool often used in cosmetic research. This experiment doesn’t provide any insight beyond skin moisture, like skin penetration of an active affected by combination or routine, for example. 20 female volunteers participated in this experiment. Eight 3-by-3 cm squares were drawn on the legs and forearms of each volunteer and were randomized to receive eight different routines and combinations – including a square with no product applied, acting as a control. The baseline moisture levels of the squares were measured and categorized into ‘normal’ or ‘dry’ by a limit of 35 a.u. (a measurement unit used by the Corneometer). Stratum corneum moisture levels were measured every 2 hours, including a baseline, and participants were kept in a 22 °C room with a 50% humidity. and Avene Thermal Spring Water was used as the Mineral Water Spray. While applying any form of skincare product created an increase in skin moisture in dry and normal skin, some combinations were significantly more effective than others. Because the normal or dry categories were determined by Corneometer, there’s no way to self-categorize unless you have a Corneometer handy. From this experiment, the increase in moisture from Cream then Toner, or Toner then Cream, or Cream only were about the same. This implies that the total amount of cream and toner applied is more important than the order of application. As well, this also implies that the increase in moisture is mostly from the cream and not the toner. The researchers speculate that the increase in moisture reaches a peak depending on factors like the environment which slowly declines after application. Toner on its own did increase moisture of the skin, but even when combined with cream never surpassed the moisture gained from cream alone. In terms of supplementation of Cream with Water or Toner, the greatest increase in moisture was achieved with application of a Cream then Toner every 2 hours. Supplementation of Water after Cream application reduced skin moisture with each application. Toner with additional Toner supplementation increased skin moisture over time, but was still less than Cream and Toner. I think reading descriptions of the effects is likely a bit confusing, so I encourage you to use the interactive charts to compare different applications. Also keep in mind that this experiment used three specific products and concentration of ingredients will vary between products. So it’s best to use this information as a guideline, but not a rule. This is a self sealing, airless, and metered dose dispensing system. The bag doesn’t leak product when squeezed, but when the button is pressed…it dispenses the same amount of product each time (or at least close). It was designed to deliver skincare products and drugs. Sadly the company is no longer in business and this is probably one of the last prototypes sitting around. As a testament to its storage ability I think this one is almost 9 years old! Poly-D’s MDS patented pump and valve dispensing mechanism allows for easy, one-handed dispensing of an exact amount of product with viscosities up to 50,000cps. The vacuum-based technology means the pump forces it out of the pouch (98% of it) in a neat and clean manner, and because it is a vacuum-based technology, it works in any orientation. The MDS valve only opens when the button is pressed and then seals tight upon release, eliminating the need for caps and closures. It can be used as a stand-alone dispensing package or integrated into applicators or custom-designed devices.